A suit is the first choice to look formal in a fancy way for men. It’s just easy to put on since they are the usual wear for a busy guy. Some guys want to play off with the suit, choosing a lighter color to outstand from the crowd. Like the gray suits, which is really an eye-candy to many, but this light to medium gray suits are quite tricky to perfect the look. Since the gray suits look less formal than the darker suits, you should be aware of the combinations of the articles of clothing to pull off a fashionable and at the same time, respectable style. Hence, gray suits are not recommended to be worn as a business attire for the reason that they are lighter. But for sure they will make a perfect outfit in an office setup. They are more like a relaxed version of suits. There are some important things to remember in mixing some pieces of clothing with your gray suit. Whenever you feel like wearing a gray suit, you must be careful in choosing colors, the hues and shades must go well together with the color of your shirt. You should keep in mind that wearing gray suits, the colors of each piece are like Tetris, they should be put in the perfect fit. A more fancy look with charcoal gray suits and contrast is the key to styling these. You also have to consider the texture of the suit too, a well-tailored one will make you better than the usual ones. Charcoal grey suits should not be loose in size like a grandpa fit. They are more for a corporate wear, they are perfect to be paired with burgundy men’s dress shoes. Darker shades of pieces will go together well with the color of the suit to aim for a casual style. For formal style approach, these suits are often used in weddings, they must be slim fit and should use neat style shoes. Try bright colored shirts or ties. Best color choice for suit in summer months is the light gray suits. They can be used in formal events as well as in casual. When you want to look youthful, light gray suits are a best choice. They can give you more modern look. Just take extra care with them for the stain can be visible because of the lighter color. 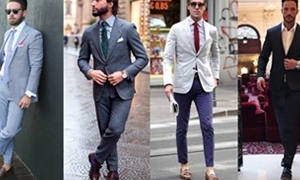 They are versatile, you can go on casual dressing with a pair of white sneakers, drawing the dashing color of the suit. And when you to pull off a casual style, go for slim shaped ties and shiny black shoes. In this part of dressing up with suits, choosing a tie that will go perfectly with your shirt is a little hard. And you don’t want to look boring either too colorful with both pieces. We’ll be needing the color wheel guide to ace the great styling. Contrasting colors or complementary ones are the best to keep in mind. Shades are important here, your tie must be one to three shade darker than your shirt, this way is contrasting technique. Meanwhile, complementary colors are a little tricky, just remember not to use stronger tones of ties because that way you would look dated. A very classic shirt, it is handy to dress up with, It can go well with any shades of gray. Ties with red tones are great to wear with this one. Oxblood, maroon, and burgandies will give more accent to the gray suit. Tan shoes will give a youthful touch to the outfit. Thinking that this is just a normal style but let the accessories carry the style. Tie bars, cufflinks, and pocket squares could add up to your appeal. Black is never out of style, black shirts are ideal to be worn with charcoal suit, nice to wear in winter season. Black can carry any skin tone well, it is also elegant to look at. You can wear any ties or bows with it since it is a good color for a base. Gray suit with black suit gives you a smarter finish, making you look slim and sleek. Bolder ties will give the look more spice, black on black is alo a way to playfully dress up. It’s actually fine not to wear a tie, you will still look smart. Torquiose blue shirt and gray suit are great to flaunt in the summer or spring. Light blue shirts are also ideal to wear to social parties. Nevertheless, they show more bumps, so better to choose the well fitted one to avoid it. Contrasting color of ties are best with this style, silk ties would make a great combination for a more formal look. Knitted ties adds texture which is a go-to for a casual events. Who says pink is only for girls? Well, actually, pink is a masculine color. A shade of powder pink can make the best pair with gray suit, like a chic in a satorial garments. It’s more interesting in choosing ties with pink shirt. Contrasting is always a good idea but ties with prints like stripes or checked are great to pick. Add some touch on your gray suit outfit with checked shirts, choose a subtle print and color. Checked shirts is a classic design shocwcasing a spry vibe. Choose a tie that has palpable color or print to stand out from of the shirt. You can wear ties with unique prints and patterns. Gray suits might be not as formal as navy blue suits, however, if we are talking about the terms of flexibility, both are just the same. Black, brown, and burgundy(Oxblood) colors of shoes are best to pair with gray suits. Meanwhile, belts are dependent on the choice of shoe colors. Always remember that the color of your belt is best to be the same with the color of your shoes. This rule applies to any outfit if you want to look smart. For example, when you opt to wear brown shoes, you better use a brown belt, a shade darker or lighter would do. Don’t settle for less, you can add up some ornaments on your outfit. You might be needing accessories for you to be more modern and stylish. Choose a pair of sunglasses with a darker color to sharpen your style. You will need a more elegant design of a timepiece, don’t use the one with cloth strap or brighter color ones, opt for metallic colors. The tiebar should match the color of your watch as well as your cufflinks. Light gray suits easily get stain and dirt, always check your suit and clean with wipes once you see a spot of stain. For office wear and formal meetings, charcoal gray suits with the slim fit are the best choice. When in the moos of going casual, light gray suit with white leather sneakers would be great and don’t show any socks. All of the accessories must be in the same color but should be darker than the suit. Wear lighter shades of shirts in hot seasons and you can wear darker hues of shirts in winter.